eMedia Guitar Collection takes you from beginning guitar lessons to being a confident guitarist who knows how to play guitar songs across rock, blues, pop, country, folk, and classical styles. 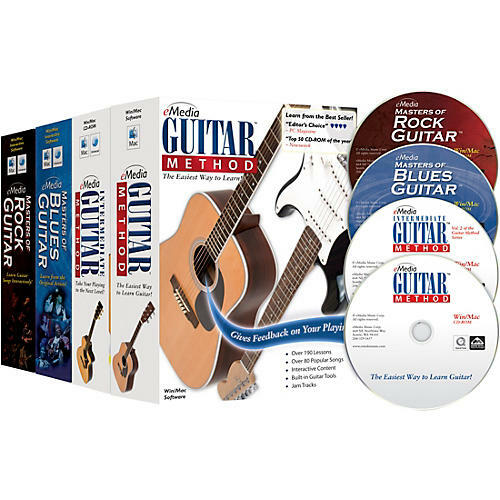 eMedia Guitar Method starts off with over 190 guitar lessons teaching you basics like how to tune the guitar, picking, strumming, and how to play easy guitar chords and songs. It also shows you how to read guitar tabs (guitar tablature notation) and guitar notes (music notation). Then Intermediate Guitar Method builds on that with over 170 more guitar lessons to teach you how to play barre/bar chords, guitar scales, guitar solos, and fingerpicking technique with even more songs. The curriculum in both guitar methods was designed with University of Colorado-Boulder’s Kevin Garry, Ph.D. and is the most complete guitar instruction software available today. eMedia music technology such as Interactive Feedback and the Animated Fretboard makes it easy to see guitar fingerings and whether you are playing the proper notes. The included MIDI tracks let you slow down the music. With eMedia guitar lesson software learning how to play guitar is easy! You also get eMedia Masters of Blues Guitar, which shows you how to play blues guitar using original artist recordings of 10 classic blues songs by Stevie Ray Vaughan, B.B. King, Muddy Waters, and others. Learn how to play the blues scale and guitar solos with string bends and vibrato complete with guitar tabs and notes. eMedia Masters of Rock Guitar goes on to teach you how to play rock guitar with 14 classic rock guitar songs. Get note-for-note guitar tabs and standard music notation for “Behind Blue Eyes,” “All Along the Watchtower,” “Oye Como Va,” “Before You Accuse Me,” “The Sky is Cryin',” “Baby, I Love Your Way,” “Magic Man,” and more. Learn the easy way with guitar lesson software that features interactive tabs, an Animated Fretboard, and software that shows you your mistakes as it listens to you play! There are even rhythm-only tracks to play along with.